If you were awake this morning at 12:00 AM (Eastern) when pretty much everyone in the comic-centric corner of Twitter started flipping out about it, then you're probably already aware of today's big news: DC Comics has gone digital on the iPhone, iPad and PSN. This is, as you might've heard, a pretty huge deal. Not just because of DC itself, but because with this, every major publisher now has a presence in the digital marketplace. With Marvel, Dark Horse, DC, and Image, all available through Comixology and IDW books available through iVerse, every one of Diamond's Premiere Publishers (the big-volume companies with the prime spots at the front of the Previews catalog) are now in a position that could potentially allow them to circumvent Diamond and the traditional -- and frequently broken -- distribution, along with non-premiere publishers like Boom! and SLG. Simply put, it's a gamechanger, especially with DC's decision to test the waters by offering "Justice League: Generation Lost" digitally on the same day it hits comic book stores. 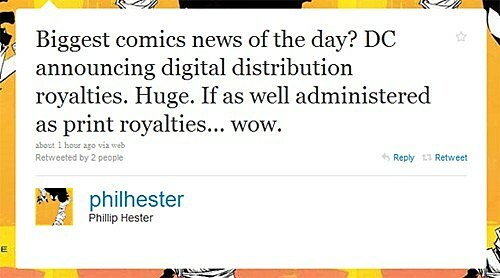 Again, this is the leveling of the playing field that you get from digital comics. When I was working in a comic book store, our customers were, by and large, die-hard super-hero fans for whom "indie comics" began and ended with "Walking Dead," if they got that far. I would've loved to carry a bigger selection of independent stuff, but the market I was dealing with often didn't allow the shelf space to devote to great titles. I did my best to keep stuff I liked in stock so that I could hand-sell it to interested customers, but I know for a fact that I lost sales to bookstores that did have the ability to cater to a market that wanted other fare. With digital, that's not an issue: "The Losers" doesn't take up any more space in Comixology than "Brightest Day." Of course, the flipside is that you don't get someone behind the counter who cares about comics and who can recommend stuff based on what you're getting or questions you ask, no matter how good the algorithm powering the "Customers who liked this also liked..." button may be. Another key thing about "The Losers": DC's made a strong effort to go digital with titles that have made it to other media. 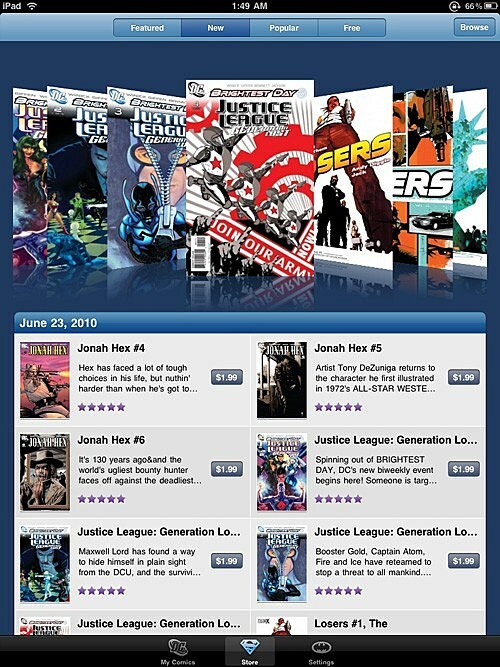 They've got the first 12 issues worth of "The Losers" and the first six of "Jonah Hex" (both of which had movies hit this summer) available for people who might be curious. As of right now, there's not a section in their branded app similar to Comixology's "Movies and TV" spotlight section on their main page, but since the "Featured" section right now is basically going "OH SNAP DC COMICS WENT DIGITAL UPSIDE YOUR FACE," I think it's only a matter of time. ...which, given the high quality of the "Marvel Adventures" line, I'm surprised Marvel hasn't done the same. 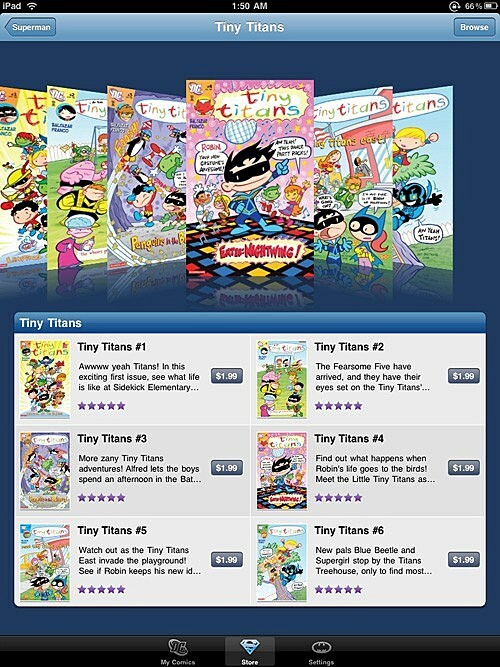 Right now it's just the first six issues of "Tiny Titans," but given how much great (and underrated) kid-friendly comics DC's put out since 1992 and the start of "The Batman Adventures," the possibilities here are huge. Which isn't to say that they're slacking on the super-heroic end. All six issues of "Green Lantern: Rebirth," which propelled Green Lantern into a huge readership and started the path towards "Blackest Night," a hugely successful event that resonated with an incredible amount of readers (count how many rainbow lantern symbol t-shirts you see at any given convention) are available for $1.99 each. Then again, that works out to a total cost of $11.94, and while that's slightly cheaper than the trade's list price of $14.99, it's still more than just going on Amazon and buying the trade for $10.19, which is something you can also do with an iPad. But I'll get back to pricing in a minute. All of these are good steps, but as far as I'm concerned, the best thing DC's doing: Free Batman. 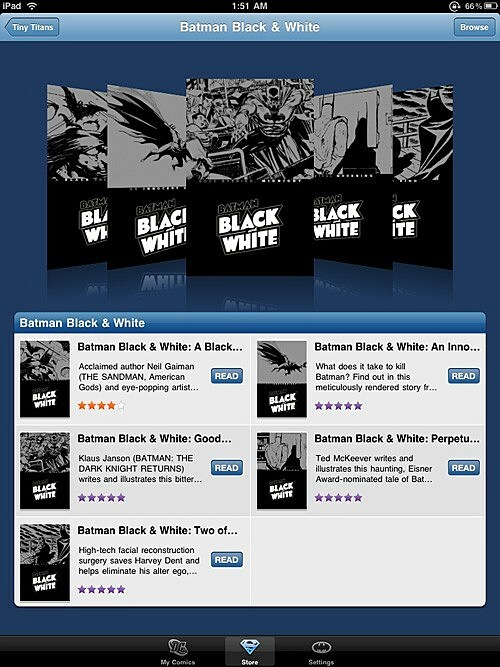 DC's offered five eight-page "Batman: Black and White" stories by guys like Neil Gaiman, Brian Bolland and Bruce Timm for free right off the bat. This is awesome, and not just because "free Batman comics" is one of the sweetest phrases the English language has ever produced. These are stories by top tier creators that tend to play around with Batman in ways that the ongoing books don't allow for. As such, as long as you know who Batman is and what his general deal is -- like, say, if you've seen a movie about him that took in over $500 million at the North American box office -- you can grasp what's going on here. Plus, at eight pages, they can be read quickly and easily, but it's still short enough to leave readers wanting more Batman, which is when they hit up the store for the first six issues of "Hush," the first two parts of "Batman and Son," or the first installment of "Batman: Year One." Another absolutely brilliant move as far as free comics: Doing the simplified two-page origins of Superman and Batman as free downloads. Kids love this stuff. Talk to anyone around my age who's been into comics since they were a kid, and I'll guarantee you that nine times out of ten, they'll have good memories of sitting down with "Who's Who" and "The Official Handbook of the Marvel Universe" and "The Untold Legend of the Batman" just reading them over and over and over, wanting to know more about who these guys were and what they did. It's the spark of curiosity that makes them want to read more comics, and that's what makes lifelong fans. I'd really like to see more of these -- they'd make great tie-ins to new projects and new series launches -- so hopefully they'll keep that up, and the fact that they did a sizable free preview of "Superman" #700 seems like they're headed in that direction. Unfortunately, while the good does tend to outweigh the bad by a long shot, there are a definite couple of misfires in the mix too. 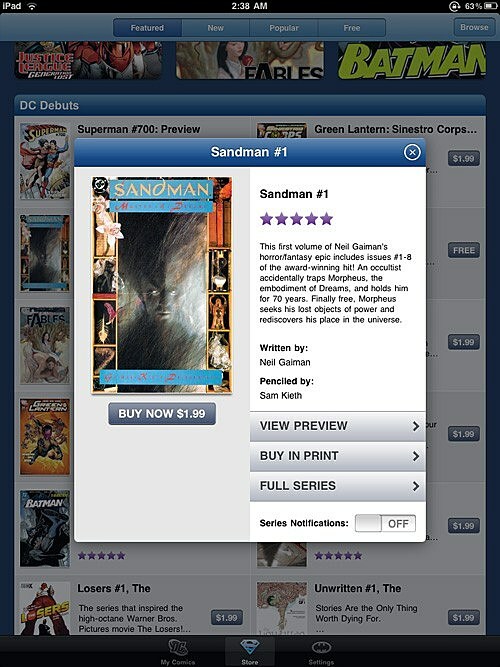 According to the text, the app's version of "Sandman" #1 "includes issuse #1-8 of the award-winning series" for the low low price of $1.99, which would officially make it the best deal in digital comics. It seemed pretty unlikely that this would be the case, but let's be honest: DC has made their money a hundred times over on the first eight issues of Sandman, and it wouldn't be unthinkable that they'd offer it up super-cheap as the ultimate gateway comic to the rest of the Vertigo line. I downloaded it to check it out, and sure enough, it's just the first issue, which gives me the idea that someone just went ahead and cut-and-pasted the description to "Sandman v.1: Preludes and Nocturnes" into the box. It's unfortunate that this mistake happened on such a prominent title, because if it's not adjusted quick, I imagine DC and comiXology are going to get a lot of people (me among them) asking for their two bucks back. 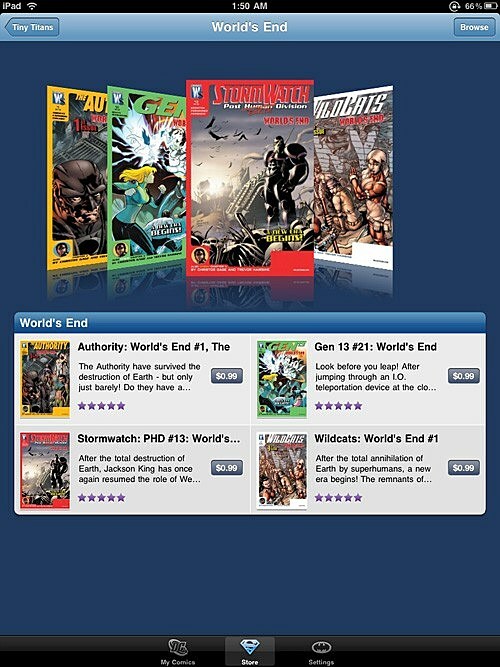 Right now that seems limited to Wildstorm and the first four books of the continuing "World's End" storyline, but much like they do with Vertigo trades (where the first volume is usually a cheap $10) and recent $1.00 first issues, it seems like a great way to get people interested in things. Unfortunately, it also leads to some pretty mystifying decisions on what didn't make the low price cut. I mentioned before that "Unwritten" #1 is available on the iPad -- which is great -- but it's also a book that sold in print for $1.00 that they're charging twice as much for the digital version. It begs the question of why, especially when the fact remains that if they get around to doing the next four, the digital versions of #1-5 will cost $9.95, while the trade of the same comics (and bonus material) costs $9.99. There's no real incentive to get the digital version other than the convenience of having it on the iPad, especially since the trade can be given as a gift or resold at Half Price Books or a local shop to cut the cost even more. Personally, I'd like to see the 99-cent pricing expanded to include more stuff. I mean, that's obvious, I want cheap comics just like every other reader, but it seems like the benefits of lower price point on older stuff (Silver Age books! ), things that were already hugely profitable ("Sandman") or that could work as a gateway ("Unwritten") would outweigh the disincentive of paying more for them. Then there's "Generation Lost," which is a huge part of the big news, as it's available on the same day as its print counterpart -- or before, actually: It was up at midnight and my local shop doesn't open 'til 10 AM and doesn't get its comics until around 11. In effect, this is the very first time that if you wanted to read a brand new comic digitally, you could do so legally and without waiting for a pirate to scan his own copy. But it's also $2.99, the exact same price as its print version, which again doesn't offer up much of an incentive to download it. There's certainly the convenience of not having to go to the shop (somewhat ameliorated by the fact that I just dropped $650 on an iPad to get this convenience), but again, why should I bother when I know there'll be a trade out that collects the whole series at a cheaper price? The answer, I think, has a lot to do with the fact that digital distribution is still a brand new model and that DC doesn't want to undercut brick-and-mortar comic book stores, which would piss off a segment of their comics buying market that's still significantly larger than iPad owners. I've been on both sides of that equation and I can see the both points (as well as the desire to get around Diamond), but the end result is that there's really not much reason to go with the digital version. Also, as a friend of mine pointed out, you can get "Generation Lost" from DCBS (a mail order service that delivers comics straight to your door, albeit slower and less magically than the iPad) for $1.79. I want to support digital comics and I especially want to support the idea of same-day digital distribution, but there's just no incentive to do so other than hoping they get the message and make it a more common practice, and right now, there's just nothing on offer from DC that makes it worth my while. Having same-day distribution at all is still a game-changer, but it worries me that the experiment's going to fail not because it's a bad idea, but because of other factors. Also, this has a lot to do with the fact that I'm only mildly interested in "Generation Lost." If it'd been, say, "Return of Bruce Wayne" #3, I would've been all over it. Another problem, for me anyway, is that while the same comics are available on the Comixology app and the branded DC app (which is also made by Comixology, as is Marvels), there doesn't seem to really be a way to integrate everything I've bought into one central location. As it stands, if I finish up reading an issue of Batman and want to read up on the Hulk, I have to head back to the home screen, pop open a different app and go through that. It's a petty complaint, I know ("OH NO, I HAVE TO PRESS TWO WHOLE BUTTONS!!!") but it'd be a lot more convenient if I could get everything centralized. Maybe there's a way that I just don't know about, and if there is, please feel free to tell me so. It's a huge step, and more than that, it's a huge step in the right direction. And this is just day one.